Contact Me With Specs Before Ordering. The decal's default size is approx. 36 inches wide by 24 inches in height. Every order arrives with a step-by-step instruction sheet and an application tool. ♥ Our decals are designed and made in the USA with commercial grade, matte finish home décor vinyl. We are committed to using the very best materials, equipment and techniques to ensure a perfect finished product. ♥ Our decals can be applied to most clean, hard and flat surfaces. ♥ Our decals will look like they have been hand-painted, but will transform your space in minutes and with no mess! ♥ Our decals are removable, but not reusable. The letters came out BEAUTIFUL on my wall :) so happy with my purchase and will be purchasing again when I move to a new apartment in the future. After purchasing my order, it was ready pretty quickly. Seller lived closer than I thought so I picked my order up, she is very nice and polite. The directions explaining how to hang up the item were easy to read and straight forward. I’m very pleased with my purchase and I will definitely buy from her again! Turned out great! Love it! ~ If for any reason upon receiving your decal you wish to return it, please reach out to us and we'll let you know what you need to do to get the decal back to us. If applicable, you will be refunded (minus shipping) in the form that the payment was received (NOT applicable to custom orders....see below). ~ CUSTOM ORDERS and customized/personalized items are not eligible for returns, so please double-check the proof I send to make sure everything is correct...including punctuation. Of course, if it's my mistake we'll fix it at no charge. * The item can not be used or damaged & must be returned in new condition with all packaging materials included. We strive to process and ship each order as soon as possible!! Each decal is cut to order and usually ships within one week via USPS. Orders made on a Friday, Saturday, Sunday or Holiday may not ship until the nearest working business day. If you need your decal by a certain date, please let us know...and we can discuss other shipping methods. ~Custom orders will be created on an individual basis, and at our discretion. Prices vary and are subject to change when the customization is altered/updated. Buyers will have the opportunity to review each custom order prior to purchase and will also be quoted a price prior to purchase. 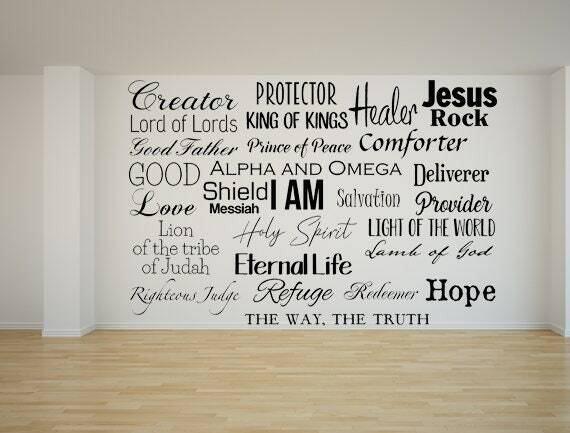 ~Scripture verse designs will only be printed using the KJV Bible. ~We reserve the right to refuse any order that contains vulgarity, adult content, references to alcohol, drugs and violence. ~ One question that we are asked frequently is if our vinyl wall art adheres to textured wall surfaces. We have never tried to apply our vinyl to a textured wall but know that the vinyl MUST be applied smoothly or it might not stick properly to the surface. With this in mind, we do not recommend applying our vinyl wall art to textured surfaces. We do have a sample test decal available for purchase, so let us know if you'd like to order that! ~FRESHLY PAINTED WALLS need AT LEAST 4-6 weeks to "cure" or the decal may peel off/not adhere properly. Please keep this in mind if you are purchasing a decal for a newly renovated/painted space. ~PLEASE BE ADVISED that vinyl wall decals typically do not adhere to walls painted with “zero VOC” or “VOC free” paint. It is not recommended that you apply our vinyl wall decals to walls that have been painted with this new paint. ~Every design comes with detailed instructions of proper application, as well as an application squeegee.